New College has topped this year’s Norrington Table, knocking previous leaders Merton into second place in the annual ranking of college academic performance. New rose from 18th, with 57 of its 114 students achieving Firsts in their final exams, in a year of significant change in the rankings that saw more New students receive Firsts this year than Upper Seconds. Pembroke, which was awarded the highest number of First Class degrees in its history, came third in this year’s table, which is still at a provisional stage. Queen’s were this year’s biggest movers, vaulting up to fourth from bottom of the table last year. Oriel, who came second last year, have sunk back to 20th position. Lincoln was this year’s lowest rank college, with just 16 of its 75 students achieving Firsts. The Norrington Table, an unofficial academic ranking of colleges, is calculated using a points system for the degrees undergraduate students were awarded in that year. A First Class degree gains the college five points, with three points for an Upper Second, two for a Lower Second and none for a Third or a Pass. 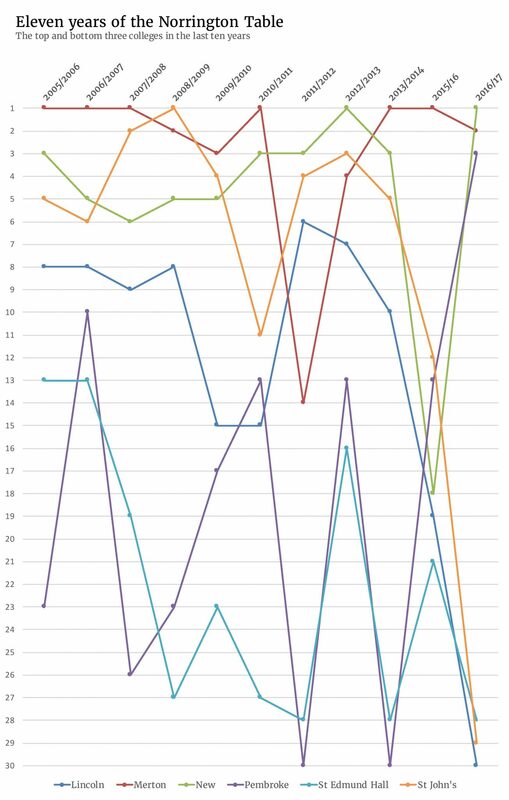 The total score is expressed as a percentage of the maximum possible score, which is all Finals candidates multiplied by five. Students responded to the news with a variety of memes. One meme, posted to the The Memeing Spires of Oxford page on Facebook, noted Lincoln’s last place finish. 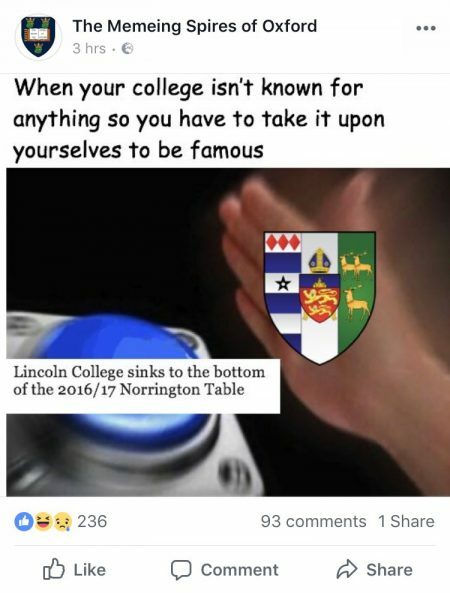 Lincoln College finished last in this year’s Norrington Table. 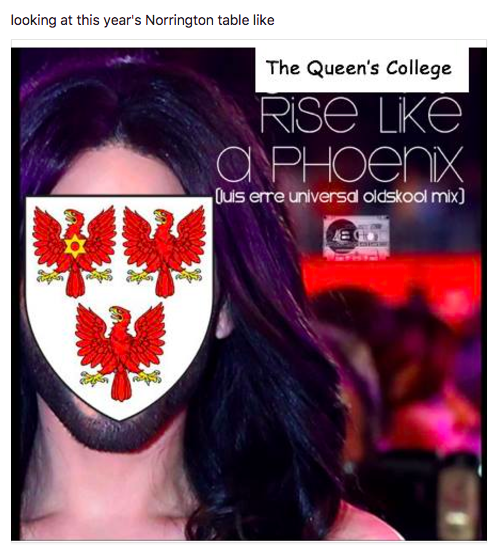 Another meme, posted to Oxford Dank Memes Society, highlighted Queen’s rise from bottom of the table last year to fourth position in 2017.